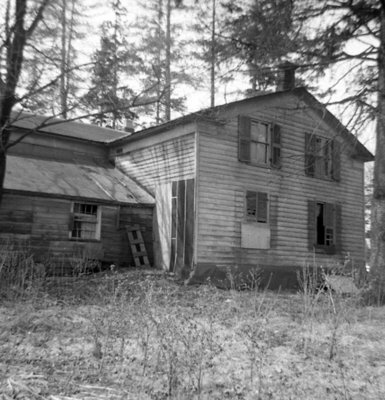 A black and white photograph of the house located on Lot 35 of Concession 1. View is of the east side of the house. The Charles Kempthorne Residence was located at the south-east corner of Highway 2 and the Whitby-Pickering town line. It was part of the community of Almonds. The house was demolished in March 1969. Charles Kempthorne was a blacksmith at Almonds. Lot 35, Concession 1, March 23, 1969, Brian Winter. Whitby Archives A2013_004_136.